Are you Bent About Your Window Screens? Trash to Usefulness! I wrote an article asking Green Talk readers “How Would You Reuse Articles that Would Ordinarily Go in the Trash?.” I have only received one response, although a good one. My reader suggested using yogurt cups for planting seedlings. Hoping to generate more comments, I started thinking about items I put in the trash and how can I reuse them. My whole way of thinking changed about trash. Could I use the spiral on the notebook I just recycled for something? Could it be used as a tie to bind something together? Hmm. I have a hate/love affair with my screens. They are flimsy and can bend easily making it hard to put them back into the windows. Some of the screens came with bent edges, or torn sections near the edge of the screen. The window manufacturer has been more than accommodating and has provided me with new screens. First, I thought I would use them as a barrier around my vegetable garden by turning them on their sides to prevent small animals from invading my garden. However, I could not figure out how to tie them together and make sure they did not fall over with the wind. If anyone has a suggestion that is handy, please let others know. I still think it is a good idea. 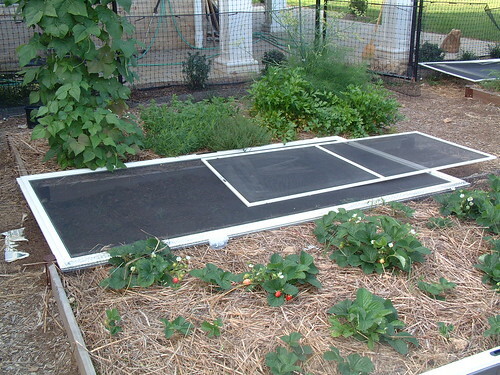 I also have unusable patio door screens, and thought I could use one of them as the entrance to my veggie garden. How would I attach the screen to the poles?That idea did not work. I still refused to throw out the screens. One day, the light bulb went off and I had a use for these screens! I planted a ground cover of curly thyme in my vegetable garden. The curly thyme was delivered to me bare root (i.e. no soil) so they were very fragile and I had to get them into the soil as soon as possible. This was not the first time I tried to plant the thyme. Last time, I did not follow the instructions to keep the plants out of the sun for a week. I thought if I planted in May because the sun was not so hot, and I watered them regularly, the plants would be fine. Well, this did not work and most died. I still wanted the ground cover and tried again. This time, I would cover the plants with my screens. As you can see from the picture above, I have raised beds so I positioned the screens on top of the beds to be cover for the thyme. It has been a week, and the thyme looks good. I have my fingers crossed that it will take this time. For those of you that do not have raised beds, you could prop them up on rocks and secure them with ground posts. Gardeners’ Supply sells earth staples, which are ground anchors. Inserting them in the screen may cause a small tear. Next spring, I am going to tie together two of the smaller screen and use them to shade lettuce or other early spring crop that I will grow in the summer. Are You Spending Too Much Thyme on Your Lawn? I live north of Toronto Ont. I get a big furnace filter once a year and hate having to throw out the old one. I pay a dollar a bag for garbage and it would kill most of a bag itself. Recycle here is free. The recycle folks only take obvious paper or plastic or metal. The filter would have been rejected being 24″ x 30″ x 6″ thick of cardboard cloth filter and wire. I dissassembled it and found it to be a few yards of accordianed filter paper attached to a thin chicken wire lining. The chicken wire can be used for any application needing a large screening, like sifting sand for rocks or as a rodent retarding liner for under porches or around lawn structures. The paper folds small and can join the recycle though it could also be reused as packing or cushion material for moving day or as a garden bed or part of a small tree winter cover. If you keep a computer on the floor some cut shapes could be used to cover various holes in the cover so cooling air would be filtered from dust bunnies. Just be sure the fans are up to the task and buy an extra one for the back wall of the computer if needed. I often cut plastic bottles for funnels and for bird feeders. I have earth floor in a root cellar in the basement (old house). I save plastic shopping bags stuffed and tied in more plastic bags. These I scatter on the floor to help prevent moisture build up and to offer cheap insulation. I’m using less bags lately how ever since we try to remember the cloth bags more often. I’m using old kitty litter to repair my driveway and roadside when rain washes the gravel away. I scoop the obvious dirt out and it joins the wet recycle or the composte, depending on time and energy. I shred a lot of paper in these identity theft times and as a result have fire starter for the back yard fire pit. That some I can think of. Boy, could I learn from you. I am going to reprint your comment in a post because it just blew my socks off. This is not as cool as the one above but we were still proud of it. My fiance and I committed to buying as much as possible from the bulk bins at the grocery store including spices. It seemed counterintuitive to use the plastic bags provided so we started looking around the house for alternatives and realized old prescription medicine bottles would be perfect. N. & J.’s last blog post..Prescription bottle? I think not…. I loved the uses for old fly screens. I recycle used window and door screens and use them as a “breezy painter’s canvas.” I paint the screens in the tradition of an old Baltimore rowhouse folk art. Painted screens in their original windows become unique decorative exterior art to share with local neighbors and travelers. As a bonus, they also offer a bit of privacy to those inside. Learn how you can “GO GREEN WITH A PAINTED SCREEN” at http://www.paintedscreens.synthasite.com/. We live in such a disposable wasteful society these days. I remember my grandmother saving orange onion bags and old nylon stockings (to stuff pillows) and drying zip-lock baggies in the dish drain. Her kitchen counter was home to a Maxwell House coffee can used for collecting old strained reuseable cooking grease. Those old nylon knee highs have many uses. I use them as lint traps on the end of my washing machine waste water hose. Green Talk reels us in with practical ideas. I stumbled in on this site, while looking for window screen painters and I’m glad to see there are becoming more sites on how to reuse or recycle items. We have a ton of tires, I use them for gardening, I read recently that tires of zinc in them and this is good for food and our consumption. My husband uses the tires for his potatoes as well. Were going more green as the time changes. We own a cemeterey and find alot of solar powered lights being thrown out, at this moment I’m trying to figure out how to collect the light pannels and turn them into one huge light for in my potting shed. Our house is made up of 13 houses that were torn down in the surronding areas from beams, to windows and doors. I think too many people get wrapped up in the new trends, I say make your own trend and recycle the old into a piece of art. Hi To get your screens to stand up like a fence or border there are 2 ways to do this. You can use the screens in frame and lash them to bamboo poles (bamboo is growable in almost any climate and it is a quick renewable resource). Put the poles inbetween each of the screens for support. Lashing should be jute or hemp. OR take the screens out of the frames and stitch them together (with the jute or hemp) to make a fence then lash them to bamboo poles as needed, Recycle the frames or if they are big enough use sections of the frames for the poles. Andrea, thanks for the great explanation. Can they be low enough to the ground that rabbit or rodent not climb under or be chewed on? I would use the screen to make a ball box for my sons’ football, basketball, volleyball, etc. as it would be kept outside anyway. A few years ago I made curtains and dividers for their bedroom using yoghurt cups and fishing line (they get to paint them). I would build a timber frame and screw the frames to the timber frame. I would then paint it in some bright primary colors for effect. It could look quite good with the plants tumbling. Great idea. Great idea! You could color the edges of the screens to assist in merging with surrounds, or even add timber trimmings. The reason I say this is the vegetable garden has times where this will be exposed and may look unsightly. I actually saw this article and inform my colleagues on what to do with left over screens. These can look really good if painted and or trimmed with timber. Great concept. Very nice idea, I tried it, I planted thyme too. Screens can protect your plants with too much heat. I told my friends to read this article how to reuse trash. Very good idea. Thank you for this article! If you have an open gutter system the screens are a godsend as barriers for the downspouts. While it may not be fancy, I appreciate the efforts you are taking to recycle. It not only helps the environment but also saves a few bucks! I will look forward to seeing more ideas of how we can reuse items around the house. I think it woud be cool to make them into art. If you paint somthing on them and cut the shapes out then you can just hang them up. Or you could cut them to fit inside a potted plant to prevent pillbugs from getting in the soil, cut a small hole to just fit the plant stem too.